Making a choice from the countless hamburger joints available to eat from may seem overwhelming to the inexperienced. Adding to the pressure of choice is the versatile nature of burgers which allows for creativity and countless options in constructing a sandwich. Hamburgers can be almost anything, and the gap that exists between some of the worst burgers and the best is pretty wide. It is very important that you choose your burger joint extremely carefully. That’s what this article is here for, though. 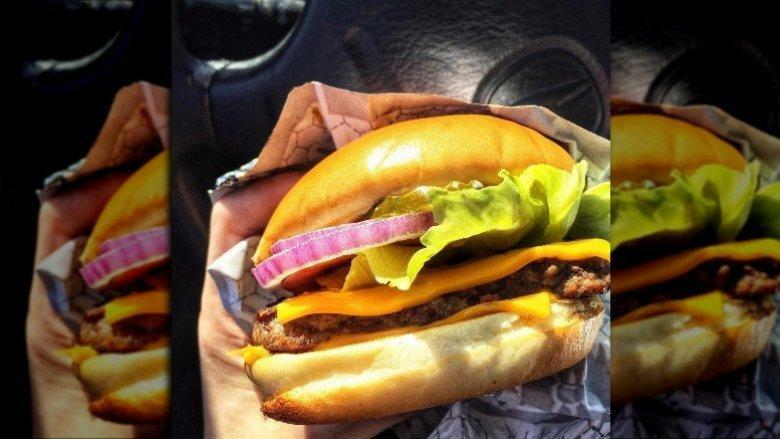 Here is a list of some of the well-known fast food burgers, ranked from the worst to the best. The fact alone that this burger chain has refused to market their hamburgers as burgers but, chooses to refer to them as ‘sliders’ is the first giant clue that all might not be right here. Well, maybe they were on to something with the different name, as customers can be a bit less disappointed when they place an order and are faced with these, instead of a beautiful burger. Touching on all the things wrong with these ‘sliders’; the dimensions may be the first. At the size of 2X2, they are just way too small. Maybe the point of their minuteness is to lure customers into buying more of them but, it’s still a big fail either way. The bun also comes in to play here, which reminds us more of a store bought roll than a burger bun. The hamburger is actually made of a thin square of patty, onions and a pickle, which makes a person feel more like a wartime refugee dealing with food rationing than a person paying for a fast food meal in 2018. 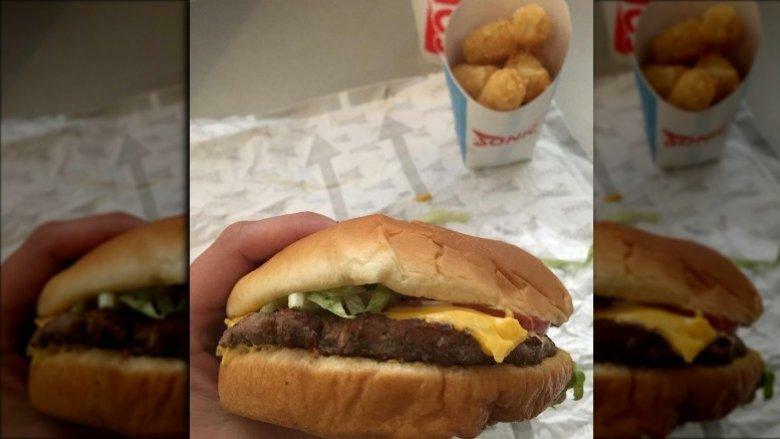 Sonic Drive-in opts to offer just cheeseburgers on their menu, following in the trend set by many other restaurants. Rather than boring ourselves with the nitty-gritty concerning the difference between the two, we will just avoid that altogether and examine the qualities that Sonic burgers contain which puts us off. The burger is really not much to rave about. 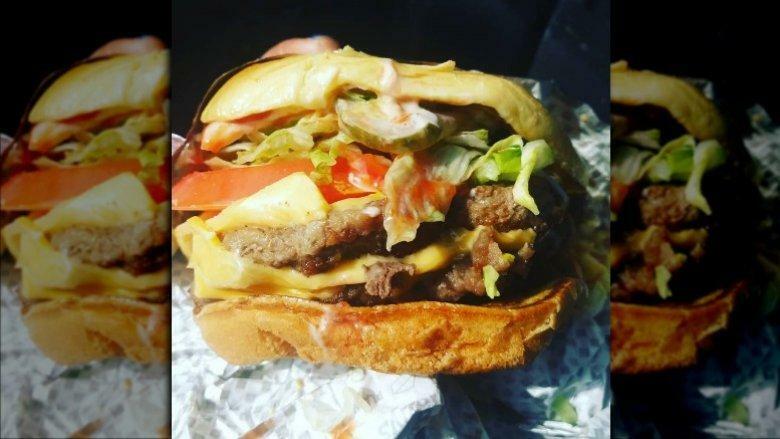 On paper, the chain has managed to portray a perfect looking burger with a patty, enticingly melted cheese, onions, pickles, and all the other burger basics. But with all the setup, it still fails to hit the right mark. Unfortunately, the burger beef turns out so dry and tasteless- almost unseasoned even, and the toppings are usually grossly unbalanced – over-excessive lettuce with too little of all other condiments. You’d probably be better off settling with a hot dog anyway. Stopping at a Dairy Queen for a quick burger is probably not the first thing that comes to your mind when you crave some fast food. Honestly, you’re better off for this. The chain’s standard cheeseburger is severely lacking in the area of toppings. And, you will be getting a bad bargain for your money; 1/6 lb. patties with pickles, cheese, mustard, and ketchup. Not too great huh? Due to its lacking in this section, the bread mostly overshadows the entire deal, not even to mention the fact that the dough is weirdly soggy. Dairy Queen also offers the Grillburger with Cheese – a typical burger with the standard ingredients. Half the time, the burger looks completely unappetizing by the time you are served. So maybe, Dairy Queen should just stick to making ice-cream in the future, and leave the burgers to the pros. “Look up ‘perfection’ in the dictionary and this is what you’ll see because the Checkerburger is everything a burger ought to be.” You’re probably wondering why a burger with such lofty accolades is doing high on a list of worst fast food hamburgers, right? That’s because the accolade does not come from us. It comes from the burger chain –Checkerburger themselves. They have that splayed across their website burger section, and we are supposed to follow them in blind faith due to their knack for catchy rhymes. On examining the Checkerburger, it definitely contains all the appropriate ingredients for a burger, but that’s about where its correctness stops. First, the parties are almost totally without flavor. The lettuce they use is also, unfortunately, iceberg lettuce; which we all know does very little by way of enhancing the overall taste of the burger. We also think that their failure to create their own burger sauce and substituting that by offering three condiments is just plain lazy. McDonald’s has earned – and rightfully so- the reputation of being the best in the hamburger business. Just mentioning the name has probably already conjured up the image of their famous clown in your head, or you’ve looked out your window to see the McDonald’s right across your street. Largeness and popularity aside, are they really the best? We will judge them in all fairness, and focus on the Quarter Pounder. 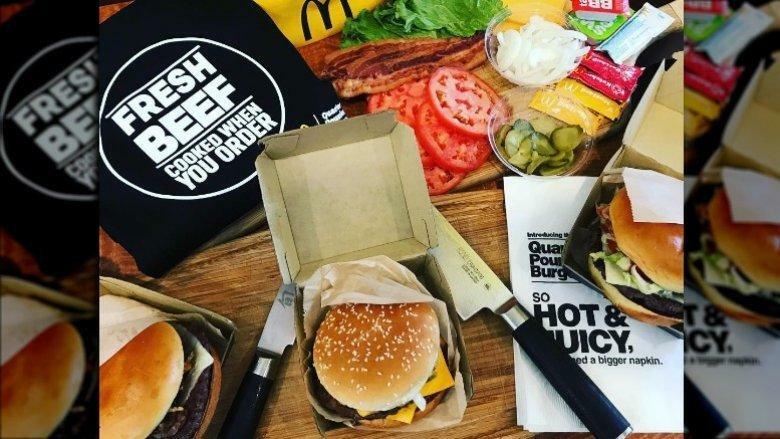 According to McDonald’s themselves, the Quarter Pounder “features a quarter-pound of 100 percent fresh beef that’s hot, deliciously juicy and cooked when you order. It’s seasoned with just a pinch of salt and pepper, sizzled on a flat iron grill, then topped with slivered onions, tangy pickles and two slices of melty cheese on a sesame seed bun.” Sound solid, right? Except for the part where there are fewer toppings options available than at most other burger chains. And, the fact that the restaurant focuses mainly on speedy service makes their presentation suffer. Most likely, you are going to be served a burger with messy toppings, dry patties, and scant sauces- that is the average McDonald’s hamburger. Burger King; probably the only burger chain that comes in close as a rival to McDonald’s. Probably also situated right down the other side of your street. Although the chain is not as big as their rival, they are just a tiny little bit better. Barely. Let us first step aside from talking about their actual plain hamburger, which is so much something of a heartbreaker we can’t contemplate that right now- and let’s examine the Whopper. 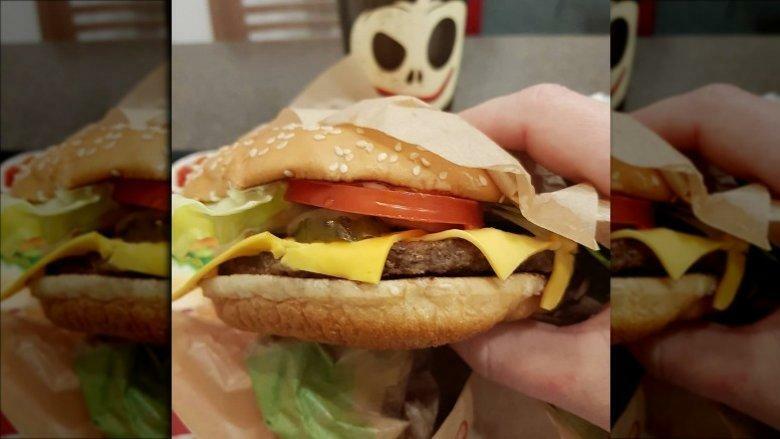 The Whopper includes all of the toppings that you would hope to see on a burger, but the major issue is that they are way too charitable with the white onion, and their patties are way too small for the size of toppings. Burger King still wins over McDonald’s though, and we’ll tell you just how. The burgers for one, taste so much better with the flame-grilled taste Burger King presents. Also, the overall construction of the burgers is better. Burger King wins in that aspect in all ways. 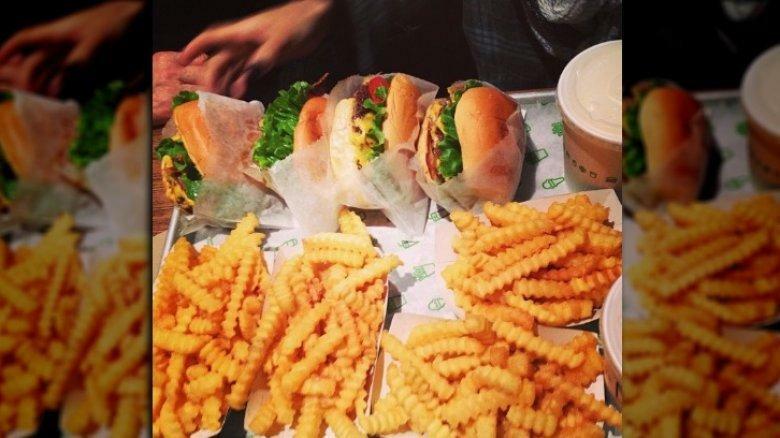 We’ll start with everything that makes Shake Shack’s Shackburger worth giving a try. The chain offers customers the option of getting double of toppings, maybe in a bid to make up for their stingy helpings of tomato, lettuce, and onion. The patties on these burgers are also better than most others on this list – they are impressively thick. The meat contains good juice and fair flavor, although it lacks in the seasoning department. And now, everything wrong with the Shackburger. The entire burger comes off as too small, even with the generously thick patty. The quality of the burgers isn’t too consistent either, and sometimes, you could find yourself receiving such a terrible burger and other days, you’d wonder why their burgers have a somewhat bad rep. 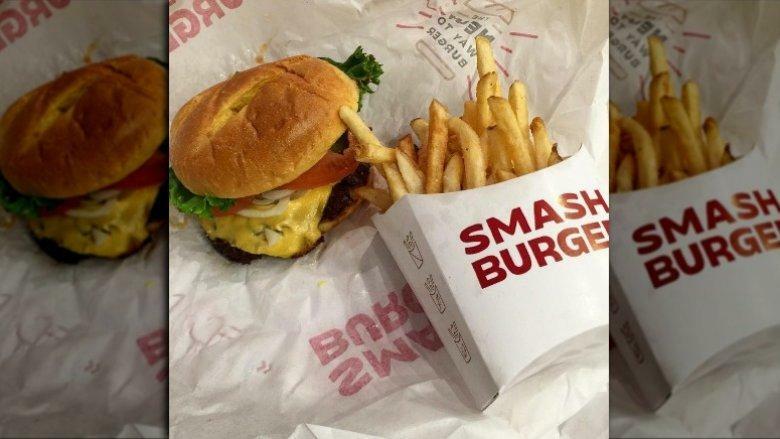 The Classic Smash burger that Smashburger offers comes in a choice of black bean, beef, or turkey patty. We will be examining the beef patty here. The burger is constructed of a patty placed between two egg buns and complemented with lettuce, onion, cheese, tomato, pickles, and their uniquely made Smash Sauce. The seasoning is not the best it could be, but the generous size of the patties slightly makes up for that. 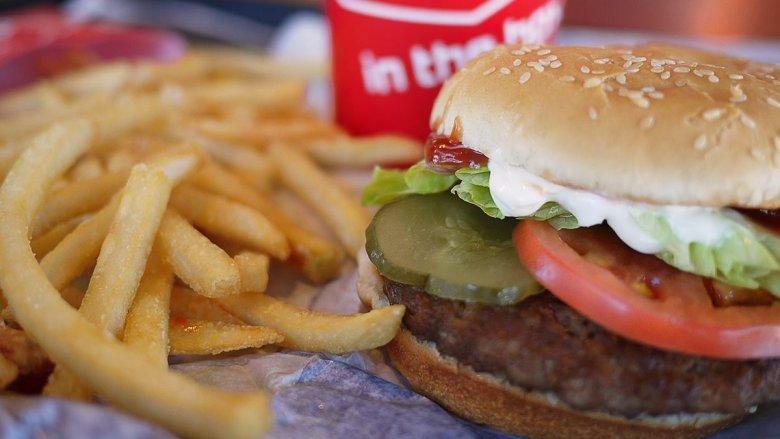 Overall, the beef is fresh, but the toppings are really nothing to write about. Their Smash Sauce barely even makes the cut for unique recipes – it is really just a combo of mayo and some mustard. They earn huge points for their choice of egg bun, though. The softness and fluffiness lend a hand in raising the burger above all other fast food chains. That’s about the only thing worth mentioning about the burger, though. Okay, but definitely not great. Thank you, next. This burger signifies the beginning of better burgers on this list. The Original Six Dollar Thickburger that the fast-food chain offers is actually the closest thing they have to a plain hamburger. The package includes; 1/3 lb. patty, pickles, cheese, lettuce, red onion, ketchup, mayo, tomatoes, and mustard. Basically the standard on all burgers, but their patty really makes them stand out – with its nice thickness and enticing flavor. The toppings also add some points, and their construction is not as messy as some of the others higher up on this list – they usually keep the lettuce and other underneath the patty and cheese instead of on top of the cheese; creating a less messy looking burger. However, the Six Dollar Thickburger really is a blah addition to this list. It definitely makes the cut as good, but it barely holds its own when stacked against some of the other, better burgers. The name ‘Fatburger’ is already enough of a statement on its own, don’t you think? And, it takes a lot of effort to maintain your target market and live up to the standards you have set for your burgers. But, this fast-food chain actually does live up to the expectations. The Fatburger is available in all sizes and satisfies just about every taste there is. The small version is basically a miniature child snack, and the size XXL is almost a mockery of a larger than life appetite. The medium sized burger is basically fine with all of the standard toppings packed between two well-toasted buns, all sitting atop a well-proportioned patty. The name basically speaks for itself – it really is a fat burger. The patty is not to be downplayed, though; it is pretty well seasoned, although a bit lean for us. The burger is in all a well-constructed burger that sits well for its size. 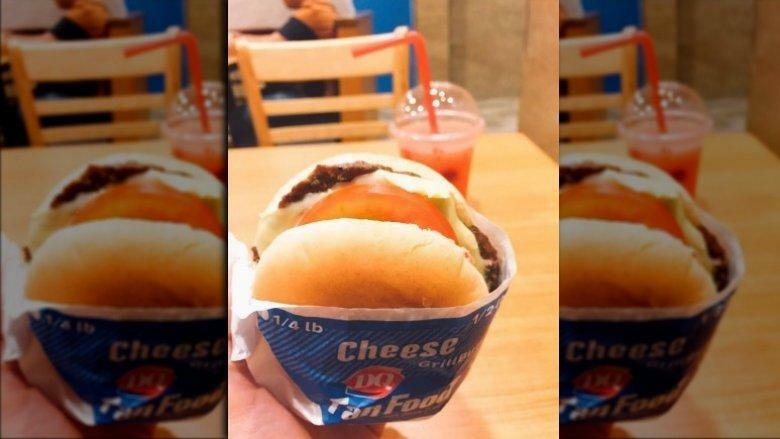 This fast food chain’s flagship burger is their Jumbo Jack; which is constructed out of a beef patty with toppings of lettuce, tomato, pickles, onions, and mayo. The beef is not quite the best in terms of seasoning, but the grilling and overall effect is better than many of its burger rivals. The burger is well-constructed, with a nicely balanced ratio of the patty to toppings, while the buns are well buttered with a subtle difference from what other burger chains offer. For the most part, this is one solid, decent burger. The major cause of concern here is that the chain opts to use just mayo as a sauce. Although I find no particular fault in the condiment in itself, it does not do a great service being used alone on a burger. A little comfort is a knowledge that they use real mayonnaise on their burgers – but they could seriously do better to up their game a bit. 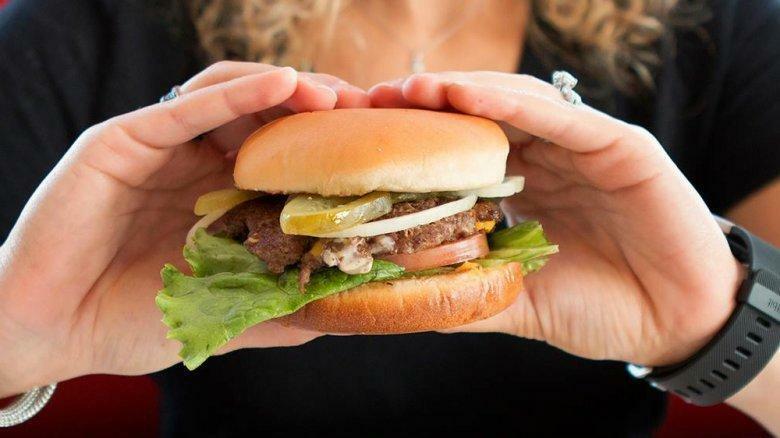 Steak n’ Shake has chosen to refer to their hamburgers by a somewhat classier name – ‘steakburger’. Often, when fast food marketing teams opt to use this kind of rebranding, it is in an attempt to simply make it appear different and high-end on their menus. Most other fast food chains offering steakburgers are basically just actual patties posing as a posh meal. But, the Steak n’ Shake steakburger is definitely different. The burgers are made from ground meat which comes from Chuck and beef brisket. The chain definitely holds their high standards as something of pride and have even attempted legal complaints against chains who use the term ‘steakburger’ to define their burgers. So, is their burger really worth all the trouble? Short answer: kind of. 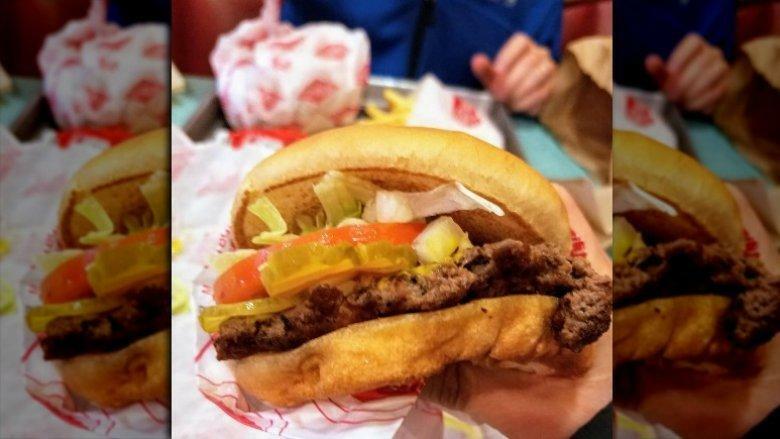 The chain’s Original Steakburger toppings are definitely up to par, with sliced cheese, lettuce, tomato, onion and pickle, and the topper of a decently toasted bun. The patty hits all the right notes in terms of juiciness and size, and its superior cut makes it stand out a bit. But, we do think that branding it a ‘steakburger’ and jealously guarding the name enough to drag someone else to court for using the same name is a bit overkill. Wendy’s delivers customers with the closest thing there is to a classically made hamburger with their Dave’s Single. Their patty is the major thing that makes the entire burger special, but worthy to be mentioned are their toppings of cheese, lettuce, onion, tomato, pickle, and mayo. We can’t really talk about all the good stuff without pointing out some of the less good so, the major issue here is their failure to include some mustard. It really fails to hit the spot when there’s just some ketchup and mayo all by themselves. On the plus side, however, there is the toasted bun, which is definitely better than most of the others found higher up on this list. The beef is fairly okay, and they gain more kudos for the fact that it is never frozen. Their patty is overall more juicy and enjoyable than most of those offered by their rivals. Good stuff. 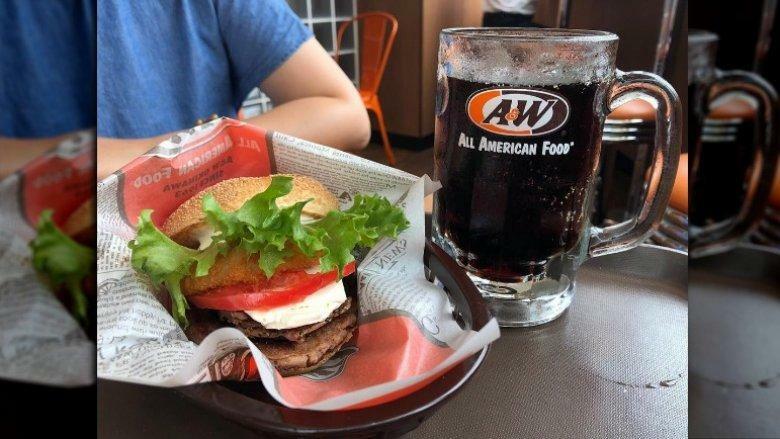 Even though A&W offers their own version of a universally disappointing value hamburger, the burger we will be examining today is the Papa Burger; their flagship burger. This is what you should expect to be getting – two 1/3 lb. patties, two slices of cheese, onion, pickles, tomato, and top it off, their unique Papa Sauce, all on a toasted bun. While the fast food chain offers a lesser burger, it is often not enough and the Papa Burger is the choice for diners with healthier appetites. The ratio of the patty to toppings is perfectly balanced even though there are two parties involved, and the perfectly butter toasted buns ensure that all stays in place. 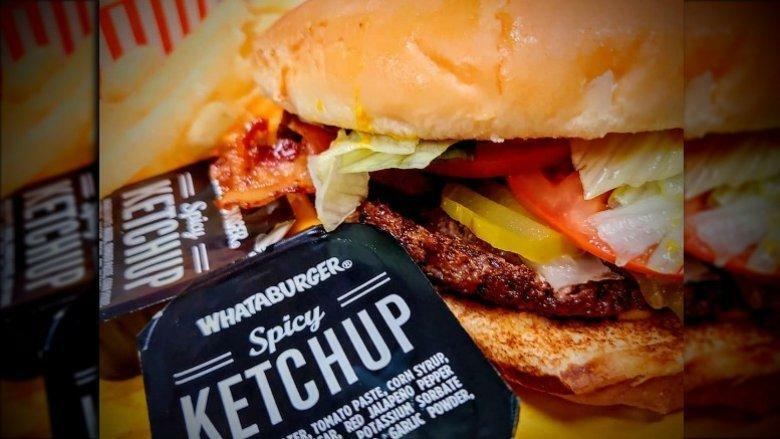 The Papa Sauce is also to be commended, as it is definitely one of the few burger sauces that actually make a real difference, rounding up the whole deal with the perfect tang that other condiments (ketchup, mustard, and mayo) usually fail to get. People may find the two-patty idea a bit too much, but if you really want to go all out, this is perfect for you. Fuddruckers think they are so good; they actually have their slogan as “World’s greatest hamburgers”. And while this might not be 100% true, they definitely get an A for effort in the greatness department. First off, they ascertain freshness by grilling every burger to order; something not a lot of big burger chains T customizable. Having the choice of custom tailoring your burger is heady in its own, and not something that one can find at some of the bigger, better burger chains in existence. 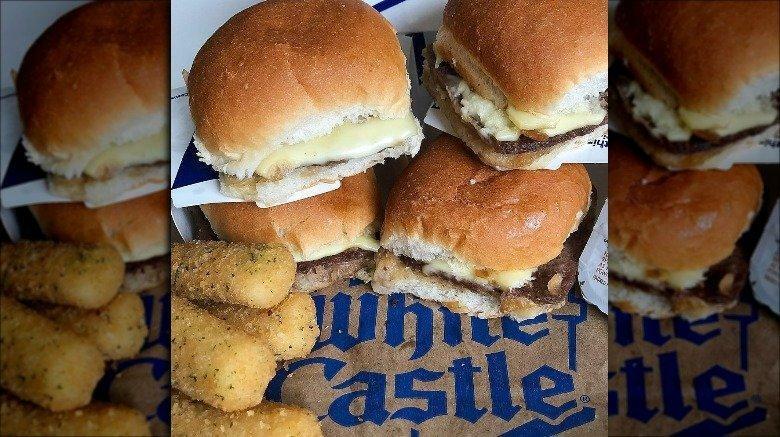 And then, the patties are definitely worth more than a passing mention. They are never frozen and they come from the absolute best-cut beef. Add the fact that they are thick, juicy and nice, and you have a winner. The downside of Fuddruckers is that they kind of impose their cheesy sauce on customers, encouraging diners to opt for that instead of regular melted cheese. We definitely do not like that, which makes this burger fall higher on our list. Now, we are getting to the good stuff. 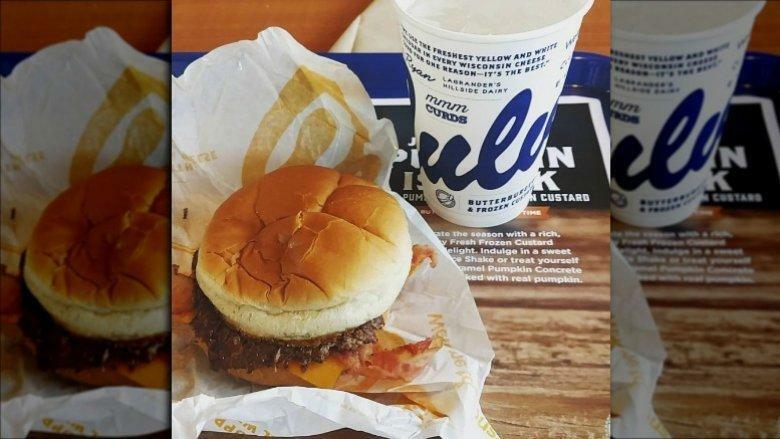 The Culver’s Original ButterBurger offers diners a well-seasoned, seared to order fresh beef served on a well-buttered, toasted bun. The toppings offered are customizable to suit each person’s taste with some of the options as – pickles, lettuce, red onions, mustard and ketchup, and even Wisconsin cheddar. 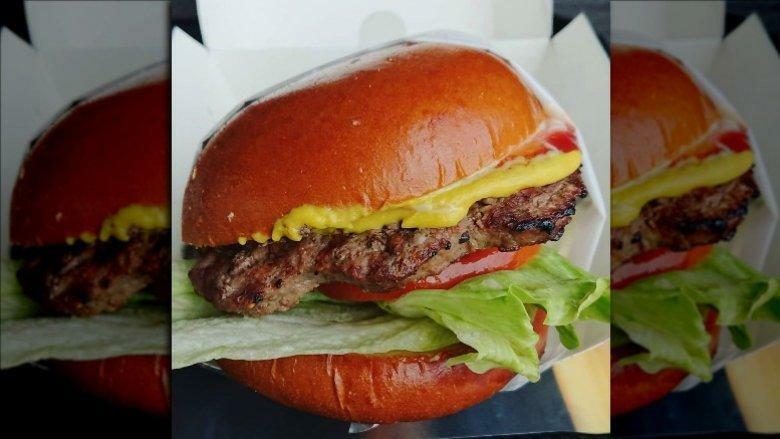 The cheddar boosts this burger chains rep, making their burger look so much better than some of their rivals’ who offer plastic looking goop in the name of the cheese. They are definitely ticking all the right boxes to score points as a decent fast food burger. Their impeccable process is also all evident in the final product. The beef is well flavored, although can also be quite dry and less thick than the ones on our esteemed top three, but the toasted bun balances that out by keeping all of the toppings in place and perfectly warm and moist. This is definitely as good as you could get without being 100% perfect. This leads us to our perfect top three. Whataburger – the go-to burger destination of any Texan. And it holds that title for good reason, too. The burger house’s main attraction is customization; diners are given the choice of choosing between any combination of lettuce, tomato, onions, pickles, mayo, jalapenos, cheese, ketchup, grilled peppers, bacon, and wait for it – avocado. Definitely a good deal, right? The patties in the burger are nicely seasoned, fresh, and grilled to perfection, while the buns themselves are well-toasted. And they are also a well-fitting size, too. Usually, Whataburger patties are wider than most of its rivals. The downside of this is that to really get a fully wonderful burger, you might have to just order a burger with double patties. But, all in all, a pretty good deal, right? 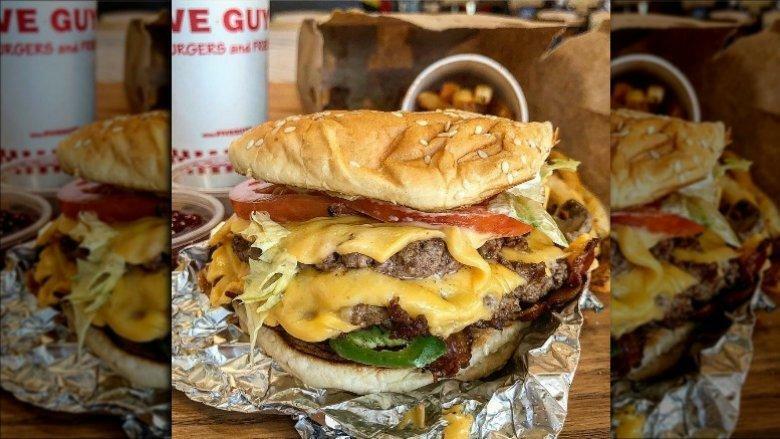 Five Guys hamburgers are built with two patties enclosed in a toasted bun with the added incentive of customer’s choice of toppings. 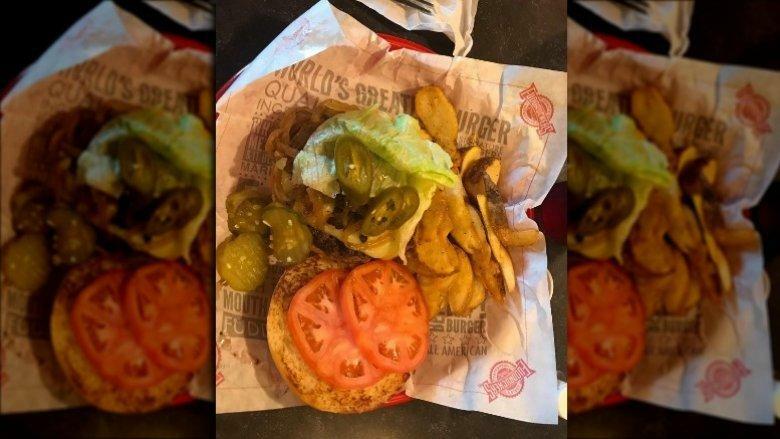 The toppings include pickles, lettuce, grilled onions, tomatoes, grilled mushrooms, jalapenos, fresh onions, green peppers, mayo, mustard, ketchup, relish, BBQ sauce, and hot sauce. The patties are succulent and well-grilled. They might be a bit too thin but, that’s why there are two parties in each hamburger to compensate. What else can we say? The buns (sesame) are nicely soft and there is a perfect balance between toppings and buns. Most times, the toppings getting in the way is due to the customer’s own choice of toppings but, with the right combination, you build a burger that is bursting with flavor. We can call to mind very few things that can rival the taste of a fresh Five Guys hamburger. And most Americans will fully agree with me. And good people of the web, here we have it… the moment we’ve all been waiting for, the crème de la crème, the king of all burgers, the undisputed heavyweight champion of the burger world: In-N-Out burgers. The toppings on the godfather of all burgers are pretty simple (tomatoes, onions, and lettuce) – which says quite a lot about moderation, but add up a truly special sauce, and anything else this burger lacks is completely made up for. 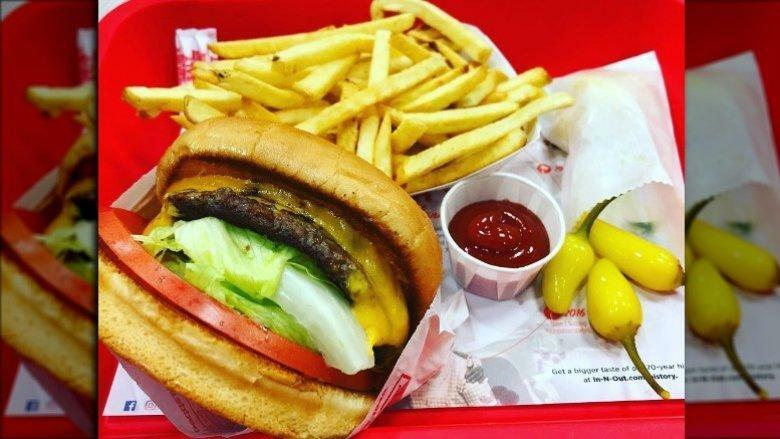 Everything that goes into the burger is fresh- take a look into the kitchen of your local In-N-Out next time you are there, and we guarantee you wouldn’t find a single freezer or microwave anywhere in sight. The vegetables are hand-selected and basically, everything is free of any preservatives or additives. The patties are perfectly cooked on the grill and, the choice of toppings may be sparse, but they are definitely generous in quantity without ever being too much. You can always tell that the ingredients are fresh, with all of the vegetables tasting so genuinely real. Definitely not something other burger chains can brag about, right?